Norton's parents, John and Sarah Norton were English Jews that immigrated from England to South Africa in early 1820. Their son Joshua Abraham Norton was born on February 4, 1818. However, there has been some significant conjecture as far as the exact year. His obituary in the "San Francisco Chronicle" cited the silver plate on his coffin, which said "Aged 65 Years", suggesting that 1814 was his birth year. In a 1923 essay published by the "California Historical Society" claimed, Norton was born on February 4, 1819. The passenger lists on the "Belle Alliance", the ship that carried Norton and his family from England to South Africa indicated that Joshua was 2 years old when the ship set sail in February 1820. (making it 1818) On February 4, 1865, the "Daly Alta Newspaper" wished Norton a "Happy 47th Birthday", which would make his birthday February 4, 1818, and not 1819. The bottom line is that he was born on February 4; as for the year, it is up to you to decide. Norton was born in the Kentish town of Deptford, England, which is now know as "London", but spent most of his life in South Africa. His parents were very wealthy merchants. In 1849, Norton's father passed away and left him $40,000 (the equivalent to $1.1 million now). Norton immigrated to San Francisco, California on the "Hurlothrumbo", a famous and luxurious steam yacht. He became very successful in real estate and other enterprises. By the early 1850's, Norton had accumulated over $250,000. During this time China was experiencing a severe famine. They placed a ban on exporting rice, which caused the price of rice to sky rocket in San Francisco from "4 cents a pound to 36 cents a pound". When Norton heard that the ship "Glyde" was returning from Peru carrying over 200,000 pounds of rice, he purchased the entire shipment for $25,000 , which would equate to "12 cents a pound". He would corner the market!!! Shortly after signing the contract, several other ships arrived from Peru, and all were carrying loads rice. This reduced the price of rice to "3 cents a pound". Norton tried to void his contract, saying he was misled...but as they say...let the buyer beware. From 1853 to 1857, Norton litigated for his money. Although he finally won in the lower courts, the Supreme Court reversed the decision. All of his real estate holdings in North Beach and other areas were foreclosed. He even filed for bankruptcy. By 1858, he was living in a beat-up "working class" boarding house. On September 17, 1859, after being disgruntled with the "inadequacies of the legal system", Norton announced in many letters and newspapers that he was "proclaiming himself Emperor of these United States". Later he added "Protector of Mexico" to his title. This started his unprecedented and whimsical 21 year reign over America. 3. The next month he summoned the Army to remove the "Elected Officials of the U.S. Congress". Norton's orders were ignored by the Army and the Congress. 4. Further decrees dissolved the Republic and forbid the assembly of any members of Congress. Norton's battle against Congress persisted throughout his reign, but he "finally allowed Congress to exist without his "Official" permission. 5. Hoping to resolve disputes that led to the Civil War, in 1862 Norton issued a mandate that the Roman Catholic Church and the Protestant Churches must publicly "Crown" him as "Emperor". 6. Since the government ignored him, on August 12, 1869, Norton abolished the Democrat an Republican Parties because of their desire to confuse the people of the United States. In 1872, he proclaimed "If anyone uses the abominable word "Frisco", they shall be guilty of a High Misdemeanor, and shall pay into the "Imperial Treasury" the fine of $25.00". Most of Norton's decrees lacked substance, but some of his ideas were visionary. Norton decreed that a suspension bridge be built to link San Francisco to Oakland and that a subterranean tunnel be built too. On July 9, 1933 the San Francisco-Oakland Bay Bridge began construction and finished on November 12,1936. The construction of the Bay Area Rapid Transit's (BART) trans-bay tube was completed in 1969, with the trans-bay rail service starting in 1974. With the help of some Army officers, Norton wore an elaborate blue uniform adorned with gold-plated epaulets on the shoulders, and a beaver hat decorated with a peacock feather with a small rose. He carried either a cane or an umbrella depending on the occasion. He would conduct inspections of sidewalks, cable cars, the repairs of public property, and the appearance of police officers. Norton was famous for his lengthy philosophical speeches to anyone close enough to listen, but not fast enough to get away. Norton was loved and respected by the citizens of San Francisco. Although he was penniless, he ate regularly in the finest restaurants. Owners erected brass plaques at their entrances which read "By Appointment to his Imperial Majesty, Emperor Norton I of the United States". No theatrical performance in San Francisco would dare open without reserving balcony seats for Norton. In 1867, Norton was arrested and committed for treatment for his mental disorder. Upon this discover, the police chief ordered his immediate release and ordered a formal apology to his "Majesty". Norton granted an "Imperial Pardon" to the policeman for his error in judgement. Subsequently, all police officers of San Francisco were required to "Salute the Emperor" as he passed on the street. 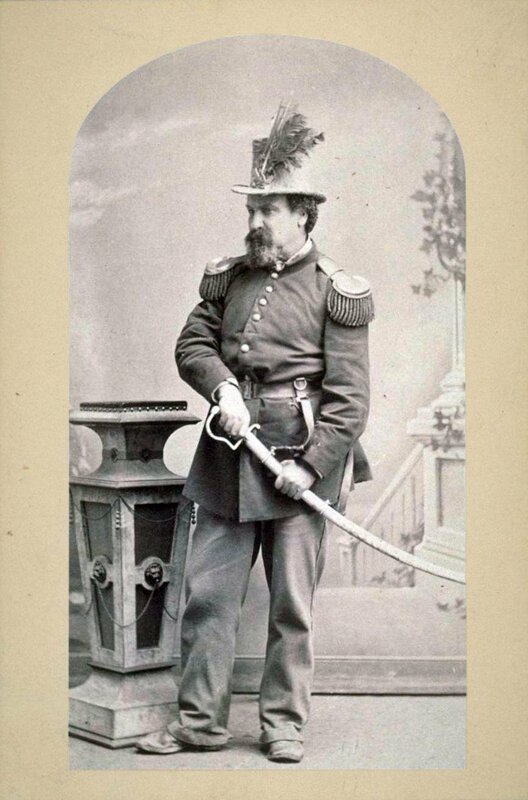 On the U.S. Census of 1870, Joshua Norton was listed as 50 years old, residing on 624 Commercial Street, his occupation was "Emperor", and was listed as "insane". Norton issued his own money to pay his debts. These creative notes ranged in the denominations of 50 cents to $10.00 with "The Imperial Government of Norton" on them and of course were "approved" by Norton. These were accepted everywhere and are considered "collector's items" today. On January 8, 1880, Norton collapsed on the corner of California and Dupont Street (now Grant Avenue) in front of Old Saint Mary's Church while on his way to give a lecture at the California Academy of Sciences. The police rushed him to the City Receiving Hospital, but he died before its arrival. The next day the "San Francisco Chronicle" published his obituary on the front page stating "Le Roi Est Mort (The King is Dead) Norton I ...By the Grace of God, Emperor of the United States and Protector of Mexico has Departed This Life". Other newspapers printed similar articles. Norton died with only $5 or $6 in his pockets. In his boarding house was a single $2.50 sovereign note, his collection of walking sticks, a battered saber, his uniform including his red laced Army cap, a derby, and a hat that a conductor would wear. In addition, there were "fake" telegrams celebrating his upcoming marriage to Queen Victoria sent by Emperor Alexander II of Russia and the President of France. There were several letters written to Queen Victoria and 98 shares to a worthless gold mine. Originally, Norton was to be buried in a "pauper's coffin" of redwood; but members of the Pacific Club, a prestigious businessman's association in San Francisco paid for a handsome rosewood casket fit for an "Emperor". Norton's funeral on Sunday January 10, was a mournful occasion. Over 10,000 people from all classes came to wish him a proper goodbye. This group included poor folks, thieves, clergyman, businessman, and well dressed "ladies of the evening". It stretched over 2 miles. 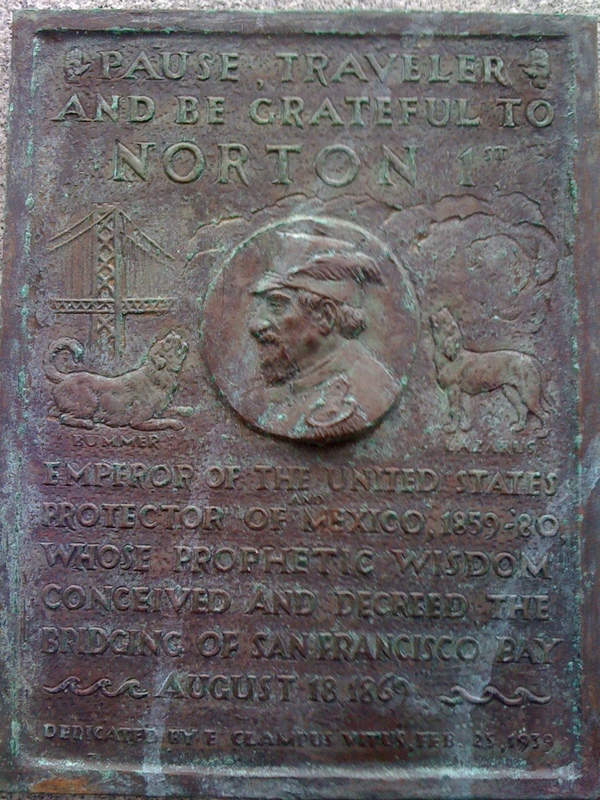 Norton was buried in the Masonic Cemetery courtesy of the City of San Francisco. In 1934, Emperor Norton's remains were transferred along with all of the other graves in the city, to grave sites at Woodlawn Cemetery in Colma, California. His grave is marked by a large stone inscribed "Norton I, Emperor of the United States and Protector of Mexico". In 1939, E. Clampus Vitus dedicated a plaque commemorating Emperor Norton's call for the construction of a suspension bridge between San Francisco and Oakland via Yerba Buena Island (formerly Goat Island). Although ECV proposed that it be mounted on the new bridge, it was denied and was installed at the "Cliff House". In the 1990's the plaque was moved to the Trans-bay Terminal. When the terminal was closed and demolished in 2010, the plaque was put into storage, where it remains today. In November 2004, the San Francisco Board of Supervisors wanted to rename the entire bridge after Emperor Norton. On December 14, 2004, the board authorized any new "addition" to the bridge like the new Eastern span would be named "The Emperor Norton Bridge", but it failed. In June 2013, 8 members of the California Assembly, joined with 2 members of the California Senate introduced a resolution that the Western span of the bridge be named "Willie Brown", after the former California State Speaker and San Francisco Major. In August 2013, the public petitioned to have the entire bridge be renamed for "Emperor Norton", but to no avail. The "Emperor's Bridge Campaign is still alive. They are purposing that the name change to "Emperor Norton" be placed on the state ballot in 2018 to "Commemorate the 200th Anniversary of Emperor Norton's Birth". In 1872, Emperor Norton I, Protector of the United States and Mexico, asked for funds from both citizens of San Francisco and Oakland to survey the construction of a suspension bridge between the two cities. Following the intent of his decree, the construction began in 1933 and completed in 1936. As the retro-fitting of the bridge is near completion in 2013, it is only fitting to honor the man, who is a legend of San Francisco history, by naming it after him.